The Wonders of the Wabash (WOW) program is part of STEM education. September is a great month to have this program, it’s early enough to where the teachers can use what the children have learned and expand upon it. Or, in some cases, the program is an expansion of what they have been studying. Before this excursion, the TCPWQ Educator will have visited each school participating in Wonders on the Wabash. The educator will have explained to students and teachers what their day on the water entails. All the students will have preformed a pre-test for this trip. All the students, parents and teachers will be aware of what the students will be learning about and tested on, and what to bring for the day. Students will be aware that they will be competing against other rafts for high test scores. This is not a race of paddling the fastest. A one-of-a kind T-shirts, will be awarded to the raft with the highest test scores. Your day will begin when you arrive at Fort Ouiatenon, located at 3136 S River Rd, West Lafayette, IN 47906, between 8 AM and 8:30 AM to park your vehicle for the day. 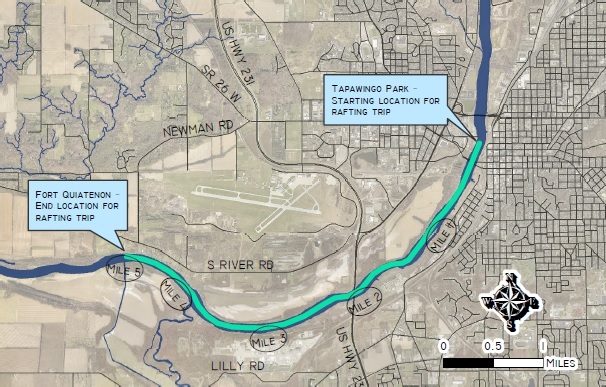 You will be shuttled from Fort Ouiatenon to Tapawingo Park, located at 100 Tapawingo Dr, West Lafayette, IN 47906. Your raft will also be equipped with one large dry bag. There will be bottled water and Goldfish crackers inside the bag for a snack at the first island. This bag is large enough to fit jackets that the students may have brought. A separate clothes basket with your group number on it will be used to store extra clothing brought by the students in case they get wet. The basket will be shuttled to the Fort by the land crew. Once all volunteers have arrived, there will be a morning meeting regarding weather updates, agenda, approximately how many students there will be, any medical or special needs we need to be aware of and to answer any questions and/or concerns you may have about the day. We want to make sure everyone is feeling comfortable about the day. Insuring the safety of your raft at all times. Keeping track of your students at all times. Staying with your students at all times. Keeping your raft on time. Buses will begin arriving between 9:00 and 9:30. When the students arrive, a land crew person will number the students’ hands as they exit the bus. They will be directed to find the adult with the number that matches their number. Once you have all your students, introduce yourself, then send students to get a paddle and a life jacket. If you have a few minutes before morning announcements, please take a moment with your group to go over how to paddle, assign a person to journal, and get to know each other. Morning Announcements: Once everyone has their life jackets and paddles, you will gather closer to the shelter area for morning announcements. Students and teachers will be welcomed, rules will be covered, there will be a quick explanation of how to hold a paddle, and any questions and/or concerns will be addresses. Launch: After morning announcements and last restroom call, we will launch. 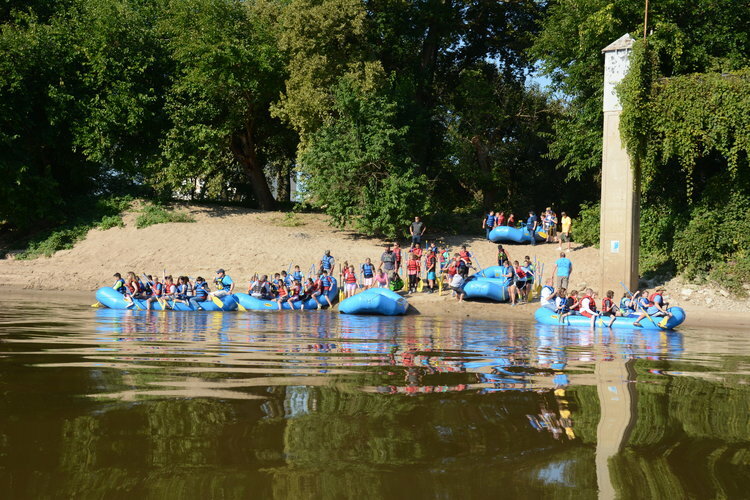 Students—equipped with life jackets and paddles—will walk down to the sandbar where all the rafts have been inflated and prepared to be launched. Please be prepared to have wet feet and possibly wet clothing. You may get wet. We strongly suggest you wear old closed toe shoes, water shoes, or Keens. Please do not wear Crocs or water socks. We suggest bringing a change of clothes and foot wear. Once rafts have reached the boat ramp at the Fort, you and your students will be responsible to carry your raft up to the grassy area. Life jackets will need to be spread out on the grass to dry. Paddles will be placed in a pile near the bins. You and your students will head to the shelter. Tables will be marked with your raft number. This is a great opportunity to have table conversations with your group! Ask them questions! Kids love to talk, find out what they liked about the trip. If we were unable to stop at Lafayette Renew, we will be having the session at the shelter. It’s lunch time! Tables will be dismissed in an orderly fashion. Please keep your students at their table until their number is dismissed. The winning raft will be announced and T-shirts passed out to the raft with the highest test scores. Suggestions on what you should bring on your day. A change of clothing—you may get WET! In the event of an emergency while on the water, Emergency Personnel will be present in a motorized safety boat. They will have a first aid kit and will be able to assist. The trip will only be canceled in the event of severe weather or dangerously high water levels. If the day is canceled, you will be notified via text. Unfortunately, if we do have to cancel, we cannot make up that day. 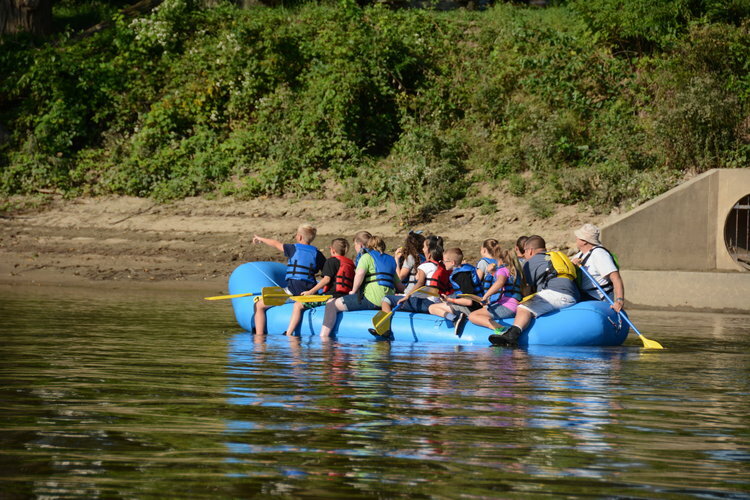 Click here to volunteer for the 2019 WOW rafting trip. This link will open in a new window. Background form here. This form will need to be completed before you will be allowed to volunteer. Please mail, fax, or email this form to the TCPWQ. There will be no cost to you for the background check that will be ran through the Tippecanoe County Sheriff’s Department. Thank you for your willingness to volunteer. We look forward to seeing you on the water!